Dameon Grove brings nearly 30 years of commercial vehicle industry expertise to new role heading up IVECO Retail. Vehicle’s strong performance and tall loading space proves critical as Brentford-based firm places first company order. Jost Group chooses IVECO’s Stralis NP for the conversion of its fleet to cleaner fuels. Guest Sherwood will be there! We'd love to see you. Gerard de Rooy and Federico Villagra win first and second place in Stage 6, arriving in San Juan de Marcona in great form. Team PETRONAS De Rooy IVECO and its four IVECO Powerstar trucks are at the Start Podium ceremony of the 41st Dakar Rally, ready to take on the most extreme terrain, which for the first time will be entirely run in one country, Perú. IVECO helps to bring a special Christmas to more than 2,000 children in a small and remote town in Northern Brazil. PIMK Ltd has increased its fleet with 50 new IVECO Stralis NP 400 hp trucks running on Compressed Natural Gas (CNG) to provide green logistics services to its partners. IVECO leads the way in sustainable transport with its advanced natural gas technology. Today has seen the Iveco Daily handed to King Lifting. The PETRONAS De Rooy IVECO team will compete in the 41st Dakar Rally with four IVECO Powerstar trucks, which will be driven by Gerard De Rooy. Luton-based start-up looks to the future with IVECO’s alternative fuel options. British Truck Racing had a spectacular weekend of family entertainment which ended with a ‘big bang’ on the Sunday – the longest, biggest and most spectacular fireworks display yet! Strong dealer support and enhanced payload capacity prompts national firm to increase IVECO’s share in fleet. Recycling specialist Warrens Group has taken delivery of a 16-tonne IVECO Eurocargo Natural Power. Running on compressed natural gas (CNG). An IVECO Stralis NP 460hp truck from the UK has completed what is believed to be the longest ever journey by road on a single fill of LNG. Brand new entry-level Daily model to offer maximum profit potential to fleets. A week before final Grand Prix in Jarama, Spain, IVECO is crowned the overall winner of the European Truck Racing Championship 2018. Dealer support key to Greenford-based company switching entire fleet from rival marque to IVECO. Our Stoke site supplied an IVECO Trakker 8x4 to Cheshire Grab Hire. IMMEDIATE AVAILABILITY. Please call 01772 426 704 for more information. Hayes-based operator says smoothness of ride benefits passengers and driver. We’re excited to return to the Wessex Truck Show this August. And as a valued customer, we’re inviting you to come and enjoy the show with us and experience all the latest that Hendy IVECO has to offer. For the second time in less than 12 months, global engineering company thyssenkrupp has replaced part of its DAF truck fleet with brand new IVECO vehicles from Guest Truck and Van. HI-SCR. No Forced Regeneration. In stock. IVECO’s display will highlight the far-reaching environmental benefits of natural gas in transport – which can deliver emissions cuts. We love getting emails like this! Thank you Richard! Global debut of IVECO Stralis NP 460 three-axle tractor marks the moment natural gas moves into mainstream UK volume. Are you going? It's going to be a great show! Convoy In the Park 2018 at Donington Park. Family-owned company, JT Matthews. Article from Trucking Magazine. We'll be displaying IVECO vehicles at the Staffordshire County Show. We'd love to see you there! 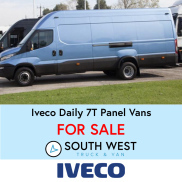 The UK's first IVECO RDE-Ready van has been sold to MTec by Guest Truck and Van. 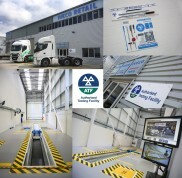 Mtec becomes first UK operator to take on one of IVECO’s award-winning LCV range. New parts line to be stocked by IVECO dealers and backed by a full warranty, offering customers confidence in the quality of their spare parts for older vehicles. IVECO’S class-exclusive gearbox seals major new order with buyer predicting a “long and fruitful relationship”. A Sherwood Truck and Van employee has picked up a national IVECO Business Pro award for outstanding sales results. Having joined the company 45 years ago, Peter Noble is officially the longest-serving employee at Guest Truck and Van Peterborough. 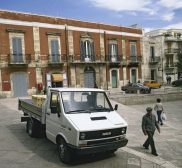 Firm rolling out 255-strong IVECO Daily fleet in first contract with manufacturer. Northern Gas Networks has taken delivery of a pair of 3.5-tonne IVECO Daily Natural Power chassis cabs, thanks to the manufacturer’s unrivalled expertise in natural gas technology and the impressive performance of a seed Daily Natural Power which has been operating at its main depot in Leeds since June 2017. The second annual IVECO Service Challenge is underway, opening the competition that is part of the brand’s accreditation programme for its network of 250 Truck Stations, the specialised dealer and workshops dedicated to the specific needs of heavy truck fleets. CNG-powered Stralis NP selected to replace diesel fuelled 26-tonner on operations in and around the capital. Accolade award in recognition of great service for Guest Tyre & Auto Centre. Congratulations. Guest Truck and Van supply ThyssenKrupp with Eurocargos and Stralis' vehicles. Major electricity distributor praises payload credentials for additions to national repair fleet. German car manufacturer BMW Group has completed a pilot project in collaboration with IVECO to test LNG-powered trucks for their logistics operations using a Stralis NP vehicle designed for long-haul transport. IVECO’s market-leading alternative fuel expertise meant they were the only choice for high-mileage heavy truck contract. IVECO and BNP Paribas Leasing Solutions have joined forces to help transport operators to renew their fleets with more environmentally-friendly commercial vehicles. We'll be there! Hall 5. Stand 5G90. We'd love to see you. Tradesman unlocks wealth of new IVECO features with exclusive app for smartphones and tablets. 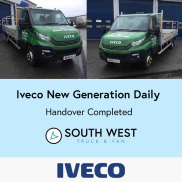 When it came to Devon County Council needing to upgrade its community transport fleet, it didn’t take long to decide that 20 new wheelchair-accessible Euro 6 IVECO Daily minibuses were the most suitable choice by far – and Hendy IVECO was happy to supply these. IVECO has appointed Chris Read as Light Business Line Director, with responsibility for its award-winning Daily light commercial range in the UK and Ireland. Order book growing for Ferqui-bodied IVECO midicoaches, as sole importer invests in Daily Hi-Matic demonstrator for nationwide customer trials. Gerard De Rooy takes top spot in the truck category of the Africa Eco Race after dominating from the start. IVECO has supplied five Stralis NPs to VERBIO Logistik, creating Germany’s first CO2 neutral fleet fuelled by biogas generated from straw by the logistics operator. After eight stages of the 10th Africa Eco Race, Team PETRONAS De Rooy IVECO pilot Gerard De Rooy and his crew still have their sights on the podium after securing fourth spot in the overall standings. Shaun Taylor has been appointed as our new Municipal, Specialist Vehicle & Emergency Services Sales Manager. Latest addition to Logmoor's fleet. Rear mounted crane - making work easier. IVECO BUS and Courtside Conversions build a fleet of 20 new 17-seat wheelchair accessible minibuses for local authority fleet. Order secured following competitive tender involving multiple manufacturers. IVECO’s commitment to using technology to improve sustainability has been recognised with two major award wins in the UK. One of the largest transport firms in Europe has announced an order for 250 Stralis NP heavy trucks, with nearly 200 to feature the new Cursor 13 460 hp natural gas engine. The 14th Solutrans trade show, being held from 21 to 25 November at the Eurexpo Lyon exhibition centre, will see an array of new features being unveiled. Energy transition is now a reality in the freight transport sector, which is the driving force behind IVECO’s unwavering commitment to cutting-edge technological solutions. Guest Truck and Van have appointed a Quality Manager, football studies graduate, Mark Brooks. Second franchise for Jon Campbell. Another IVECO from Sherwood Truck and Van. At the ECG Conference 2017 organised by the Association of European Vehicle Logistics, IVECO presented its views on the future of sustainable transport.